Clone2Go is an easy to use bulk video converter. 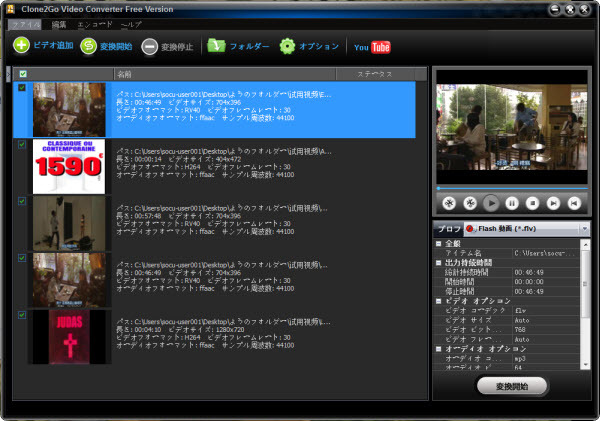 It supports a wide variety of input formats such as: WMV, FLV, MPEG4, AVI, and 3GP. You can output to an equally as wide variety of formats to ensure you can transfer your media to portable devices like the iPod, Zune, and mobile phones. Clone2Go supports batch processing so you can load it up let it convert unattended. The encoding rate is rather snappy and the GUI is easy to navigate. An added bonus if you find yourself frequently snagging video files for your portable devices off of YouTube and Google Video, is integration with the sites. Clone2Go Free Video Converter --- a flashy, yet astonishingly simple video conversion tool. With enough options to keep the advanced users busy, Clone2Go succeeds at making it easy enough on the novices as well! Easy to use interface - probably the easiest I've come across in any video conversion tool – major Good balance of advanced settings with easy profiles for beginners – major Fast encoding rate – major YouTube/Google integration. This is a handy app to own. With a world of unending choices, there are those that stand apart, and this app does so. I am no video editor, or any regular editor of any type. My needs were simple, is there a fast way to take care of .avi format for Mac users? This does the trick. I have been trying to unify file formats for some time now, to no avail. Other converters either lacked a sense of quality in the finished products, or were unsalvageable due to lag in audio to video, et cetera. I had almost become assured there was no hope for my MKV! But alas, I have an app I can depend upon to do the trick. I uninstalled my other converters, after seeing such results from a fair stress test I ran it through. The result is a simple, yet poweful little converter. It's Free Now! Don't be stuck having to pay for it! I'm glad this app was free when I downloaded it, but it is certainly worth paying for. It's exactly what I was looking for. I just needed something simple to covert MTS files into a format I could use with FCP X. I was using another free app, which I also got from the App store, but that one was to pokey and the free version didn't allow you to batch process. That app also had a problem with skipping ahead in the timeline to scan the footage... This app has batch processing, it's much faster, and is seems to be working flawlessly. Great app! Download this app for free. The possibilities of format is awesome you have a lot from iPad to blackberry over nokia and that stuff and the app is really fast!